Did you know July is National Ice Cream month? As if we need an excuse to eat ice cream!The folks at REAL Seal invited me to create a recipe to celebrate National Ice Cream Month (and provided me with a gift card in order to purchase ingredients). I love a good challenge and actually learned a lot about Real Seal along the way. Peaches are the epitome of summer for my family. The kids will eat them by the bucketful if I let them. Sure, you can buy them year round, but a peach tastes better when they’re locally grown and perfectly ripened. We had some peaches that were a wee bit too ripe to eat unless you wanted a drippy mess all over your hand and arm. I didn’t want to waste these sweet peaches, so why not make ice cream sandwiches? Even better, mini ice cream sandwiches. A couple of summers ago, I learned how to make ice cream without using an ice cream maker. Counter and storage space is at a premium in my apartment so it doesn’t make sense to buy an ice cream maker that I might only use a few times a year. The secret ingredient in my ice cream? Whipping cream. At the grocery store, I looked for dairy products with the REAL Seal logo. They were easy to spot on the cartons of milk and cheeses. I was happy to see the seal on my carton of heavy whipping cream (see above). I learned that dairy products displaying the logo have to meet specific standards and contain no imported, imitation or substitute milk or dairy ingredients. 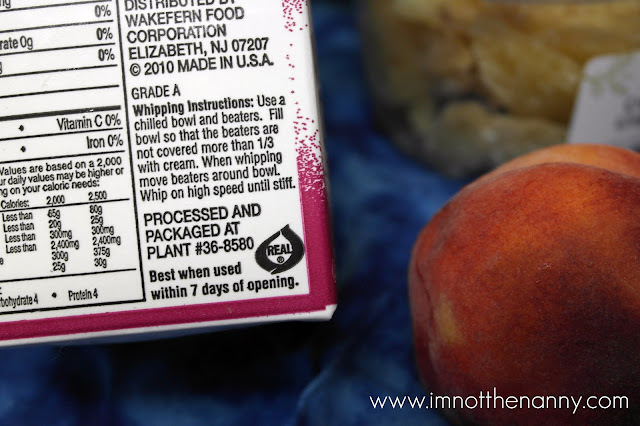 All milk with the REAL seal are produced in the United States. Pretty cool, right? Learn more about REAL Seal on their website. As someone who only consumes milk in her coffee and cereal, I’m always looking for ways to add more calcium into my diet. I think the whipping cream in this recipe fits the bill, right? It even has Greek yogurt in it, so it’s healthy! This recipe makes a lot of ice cream. In fact, I ran out of cookies to make the ice cream sandwiches and had plenty left. I don’t think I’ll have a problem consuming it and neither will you. 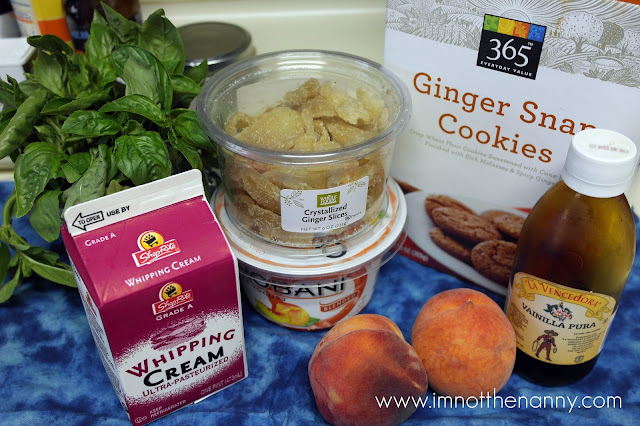 If using fresh peaches, add peaches, vanilla extract, honey and basil in a food processor. Puree until smooth and you can see little bits of basil throughout. Set aside. If using jam, using scissors or knife, finely chop the basil. Add basil and vanilla extract into jam and stir until well combined. Using either a hand mixer or a stand mixer, whip the heavy cream until stiff peaks form. The colder the whipping cream, the faster this will go. Keep your whipping cream in the fridge until you’re ready to beat it. Once it forms stiff peaks, add the peach puree mixture, Greek yogurt and crystallized ginger into the whipped cream. Gently fold in the ingredients until well combined. Pour the mixture into a shallow container and freeze for at least 4 hours. Or if you have an ice cream maker, you can use it to speed up the process. After the ice cream is partially frozen (about 4 hours), spoon onto ginger snap cookies to make the sandwiches. Place on a cookie sheet lined with wax or parchment and place into freezer until firm, about 10 minutes. You can then transfer them to another container for storage. Or just eat them.